Sorry, I have been terribly lazy of late! Seriously, what have I been doing? Nothing much. Besides work and watching anime and painting my Nausicaa model and eating a lot… nothing much at all. Perhaps it’s time for an end of summer post… I realize I have an affinity for cold foods. It’s not that I dislike hot food though, I just don’t shun cold things… I’m a warm (perhaps hot?) blooded human, after all. For some weird reason, things that should be eaten hot I often just eat at 4C. ie. from the fridge. Or even lower. I like salads, and cold, “liquid salads” are certainly great. OK, probably not to the point of the whole fadish veggie smoothies stuff, I’m talking about gazpachos! It is the end of summer, so there is not much chance left for this cold soup. I made this simple gazpacho from 1 tomato, 1/2 sweet Vadalia onion, 2 cloves of garlic, 1t balsamic vinegar, salt and pepper. 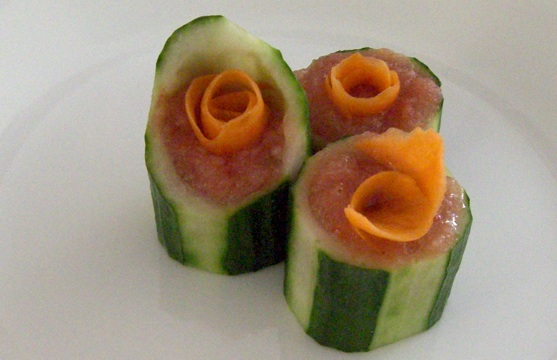 I used 1 long English cucumber and threw in the scoopings that came out of the cucumber cups. Just mix everything to a consistency of your liking in a food processor, and serve. I had quite a fun time with the cucumber cups. But you can just serve in an old fashion bowl, of course! Felicos – Redux and Greekier. Felicos Restaurant closed for months this summer and went through a major renovation. They re-opened earlier this month. They’ve looked busy ever since their reopening, but waited a little while so they can get everything going before coming. Very posh and more Greek-looking than before. Pillars seem to be a theme. They now have a hip, bluish lounge/cocktail area to the left of the (grander) entrance, with a nice bar and couches. Off to the right are two dining rooms separated by a wall. The first room is small (I thought looked rather cramped); the second is larger, quite cozy, with a big fireplace. We came for mom’s birthday. Luckily we made a reservation and were seated straight away, because it was a super busy Saturday night, and there was a consistent big line up (and no parking). I noticed a couple who did not have a reservation waited probably an hour before getting seated. Although the decor has changed, the menu hasn’t. But I’ve always found their menu to have a pretty large selection anyway: lamb, steaks, fish and shellfish, souvlaki, Greek appy’s, combo’s and platters… your typical Greek fare. They had a dinner special of lamb shank and stuffing but I chose the lamb chops. They were delish, four good size chops, but not as gamey as I like for lamb. Mom likes it better like this. I like that gamey smell more. Nonetheless, they were well cooked, medium rare, tender, juicy. No complaints about the food, it was satisfying and authentically Greek the way Felicos has always been, but not super food-gasmic. The service is neither terrible nor super attentive, although there are enough servers running around for everyone. I did find it a bit rude that they were moving tables around right behind me and I had to move, but it seemed like I was expected to, as nobody ever said an ‘excuse me’ or a ‘thank you’. It was a busy night, and unfortunately their eagerness to kick you out showed through a little too well. Overall, it’s the same Felicos food, the same Felicos people, but with the renos it’s a whole new dining experience. Whereas before I found the old Felicos atmosphere to be more family-style, now it’s more elegant and cool but still comfortable. If it was definitely worth a try before, it’s now even more so.